In a previous incarnation I conducted a legal mediation. The mediator was the retired law lord Lord Hugh Griffiths MC. Seeing a book I was carrying Lord Griffiths asked me if I was interested in military history. I said I was. He asked me if I went to the Imperial War Museum. I said I did. Lord Griffiths told me that a German tank he had helped to disable in 1944 was in the Imperial War Museum. It was uppermost in his mind because his grandson had returned from the IWM and announced ‘Grandad your tank is in the Imperial War Museum’. 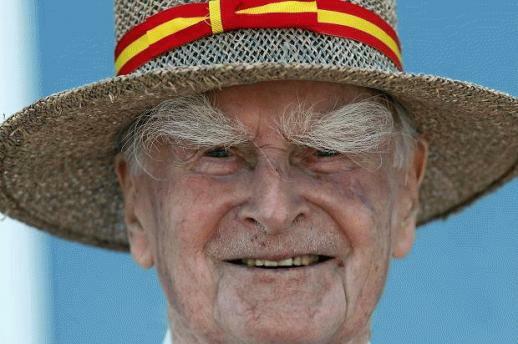 Once we had disposed of the mediation Lord Griffiths told me what happened. As a subaltern in the armoured 2nd Battalion Welsh Guards in late 1944 in the wooded park to the east of Brussels Lord Griffiths was given the task of eliminating some German paratroopers on the unit’s flank. 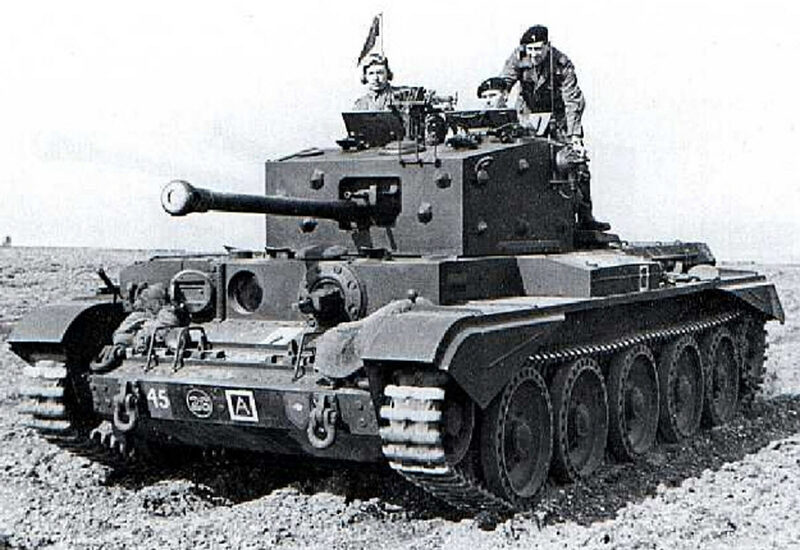 Griffiths’ Cromwell tank made short work of the paratroopers in their half-track carrier and was returning when his gunner said ‘Sir. There’s a bloody great tank behind us.’ At that moment a shell ‘parted Griffiths’ hair’. His tank did a handbrake turn off the track into the woods. Cutting through the woods Griffith’s tank cautiously approached the main track and poked its gun barrel out. Another round roared past. The Cromwell scuttled across the track and describing a wide ‘U’ came back towards the main track. There they waited for the German tank. Their attacker was one of the first German Jagdpanzers (tank destroyer with a formidable 88mm gun) in action against the British. The Welsh Guardsmen could hear the powerful engine as the Jagdpanzer advanced slowly along the main track. The Jagdpanzer appeared to their front crossing the track entrance. Griffiths ordered ‘Fire’. The response was a spatter of machine gun rounds. In his nervousness the gunner had the gun on the wrong setting. Switching to main armament the gunner fired three armour piercing rounds in quick succession into the disappearing Jagdpanzer. 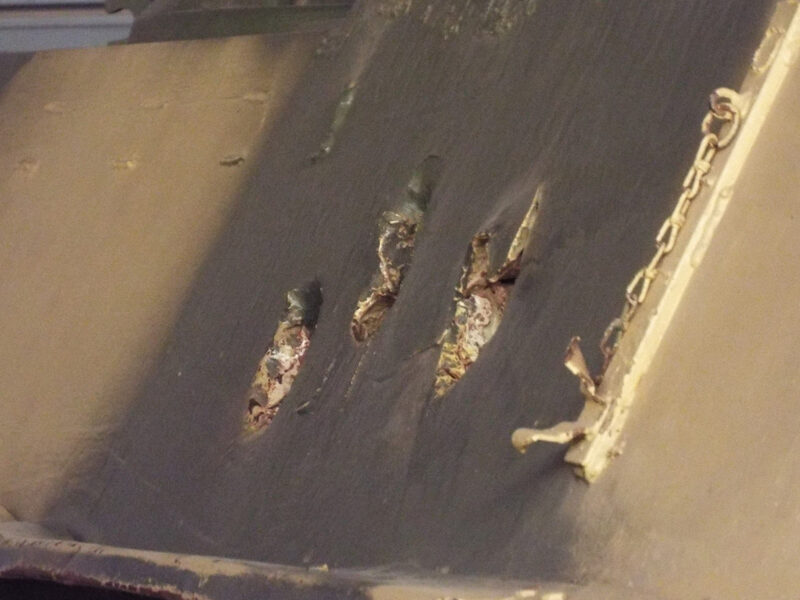 All three hit the area of armour over the Jagdpanzer’s engine. The German crew dismounted and legged it into the woods leaving the disabled Jagdpanzer. Griffith’s tank returned to their unit in some satisfaction. The next Lord Griffiths heard of the Jagdpanzer was from his grandson in 2012. 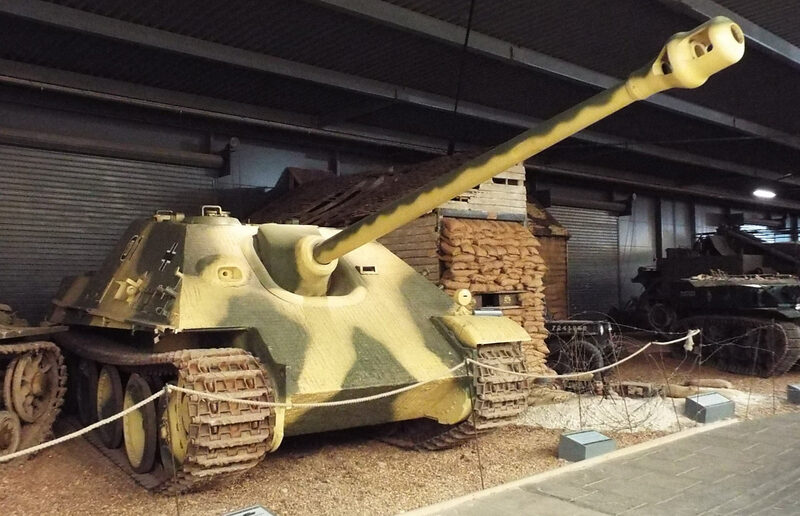 It seemed that as the first Jagdpanzer to fall into Allied hands and almost completely intact it had been removed to Bovington for assessment and in due course given to the Imperial War Museum. Once the mediation was finished I hurried to the Imperial War Museum. There just inside the entrance was the Jagdpanzer. In its rear off-side was a cluster of three neat shell holes. A plaque rather obliquely attributed its downfall to Lieutenant Griffiths of the Welsh Guards. With the reconstruction of the London Imperial War Museum the Jagdpanzer was moved to the Land Warfare Hanger at Duxford. It has been positioned so that the shell holes cannot be easily seen. The plaque referring to Lord Griffiths and his Welsh Guards tank crew has gone. What Lord Griffiths did not tell me was that he received the Military Cross for this exploit.